We are happy to offer our patients a variety of dental services, ranging from dental implants to general dentistry. Come meet Dr. Raja and his friendly team today! We offer a full-range of services to keep your smile looking and feeling its very best from orthodontics, lumineers, bleaching-whitening (Sapphire), implants, periodontal surgery, molar endodontics to wisdom teeth extractions under oral and/or nitrous oxide sedation for both adults and kids when necessary. You will also be comfortable knowing that our goal is to provide you with the most up-to-date treatments to help you look and feel your best. If you have any question, or if you would like to learn how we could help you and your smile, please call 306-825-4440. To learn more about our services and watch videos pertaining to the topic, please click on any of the services listed below. If you have any questions, please call our office. Teeth with structural damage from injury or decay can be vulnerable to infection, which can lead to tooth loss or gum disease. And a lost tooth can not only affect your self confidence, but it can also result in long-term deterioration of your other teeth and your jawbone. Restorative treatments repair damaged teeth and replace lost teeth to restore their appearance and function. Restoration also protects your teeth against future damage or decay. 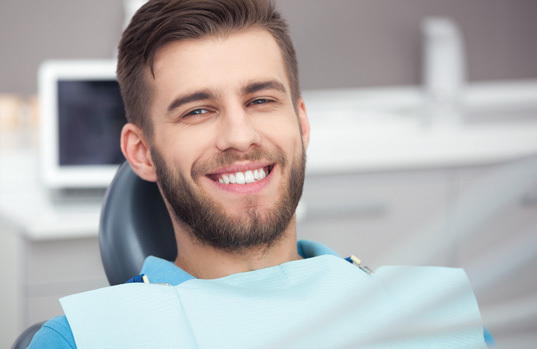 Our restoration services include fillings, inlays, and onlays to repair teeth that have suffered partial damage, crowns and bridges to replace broken-off or lost teeth, and root canal therapy to save infected teeth from being lost. Most of our physical restorations such as fillings and crowns are available in tooth-coloured composite material that blends in with the rest of your teeth. Dental implants are one of the most important advances in modern dentistry. By providing an artificial root to replace your lost natural root, implants allow us to provide a permanent, secure, and healthy replacement for lost teeth or removable dentures. Single missing teeth can be replaced with an implant-supported crown, and multiple missing teeth can be replaced with an implant-supported bridge or denture. Restorations placed on implants are secure and won't shift while you eat or speak. Implants work by bonding with the natural bone tissue in your jaws. We place the implant by drilling a small hole in your jawbone and inserting the implant. Once the implant is in place, the surrounding bone tissue begins to integrate with the implant. Over time, this forms a permanent biological bond strong enough to support a crown or dentures. A lifetime of good dental health begins with education. When you bring your child for her regular dental appointments we'll teach her how to brush and floss her teeth and about the importance of eating a healthy diet. Our family dental services keep your child's teeth clean and healthy. Regular professional cleaning keeps his teeth free from decay-causing tartar and plaque. Fluoride treatments make his enamel strong and resistant to decay, and dental sealants protect his molars from decay by keeping bacteria out of the fissures and grooves in his teeth. As your child's adult teeth begin to emerge we'll monitor their growth to detect any alignment or bite problems and recommend orthodontic correction. The Canadian Dental Association says that regular professional cleaning and dental exams are vital to preventing gum disease and decay. Decay-causing tartar is harder than bone and can only be removed with special tools by a trained hygienist. And gum disease can be present with no visible symptoms. A typical oral hygiene appointment consists of a cleaning, polishing and dental examination. The hygienist begins by using a tool called a scaler to remove tartar and plaque from your teeth, then they clean and polish your teeth to remove stains. The hygienist may recommend a fluoride treatment to protect your teeth against decay. After the cleaning, we'll give you a dental examination to spot early signs of decay, gum disease and oral cancer. We'll also check any fillings, crowns, and other dental work to make sure they're in good shape. We provide same-day emergency dental care for existing patients. If you need urgent care, contact us right away. For toothaches or other pain, over the counter pain medication may provide some temporary relief. Holding an ice pack on the area may also help. Broken teeth can usually be saved. Keep the broken pieces of the tooth and bring them with you to your emergency appointment. It's also possible to save a knocked-out tooth if you put back in its socket within ten minutes of being knocked out. Place the tooth back in its socket and call our office right away. If you are unable to place the tooth back in its socket, put it in a glass of cold milk and bring it with you to our office. Bleeding can usually be stopped with light pressure and a clean cloth. If the bleeding doesn't stop or worsens, contact us or go to the emergency room right away. Cosmetic dentistry lets you make enhancements to your smile. Sometimes even a small change to the appearance of your teeth can have a major impact on your appearance. Our cosmetic services include veneers, cosmetic crowns, and take-home teeth whitening. Veneers let you make your teeth look better in a very short time. We use veneers to change the colour, shape, and spacing of your teeth to make them appear straight, even, and attractive. Cosmetic crowns are used to completely change the appearance of a single tooth. We use them to replace teeth that are misshapen or damaged. Teeth whitening lets you choose the shade of your teeth. As we age, our teeth gradually become discoloured. Whitening treatment lets you reverse this process with a safe, painless procedure. Our take-home kits let you choose the amount of whitening you want. Invisalign invisible aligners are ideal for patients who need orthodontic correction for crooked teeth but who don't want to wear braces. These clear plastic aligners are virtually invisible while they are being worn. Invisalign works in the same way as traditional braces. The removable aligners re-align and straighten your teeth while you wear them. Over the treatment period you will regularly change to a new set of aligners as your teeth gradually shift to their new positions. Patients like Invisalign aligners because they are unnoticeable while you wear them, and because you can remove them while you eat or brush and floss your teeth. In most cases, Invisalign treatment lasts approximately 18 months. You may need to wear a plastic retainer for a few months after your treatment period ends. The wisdom teeth are the last of your adult teeth. These large molars begin to grow when you are around 15 years old. If there are no complications, they emerge behind the second row of molars. In most cases, however, there isn't enough room in your jaw for the wisdom teeth to grow correctly. This can result in them growing up under your other teeth, or growing in a crooked direction and damaging your gums and jaws. In these cases, your wisdom teeth will need to be removed. Wisdom teeth are removed before they break through your gums, which means they need to be removed by surgery. To remove them, we make incisions in your gum tissue and extract each tooth. After the teeth have been removed we close the incisions with sutures. After your surgery, you may experience pain and discomfort in the surgical area. We'll provide care instructions to help you manage this pain and ensure your mouth heals quickly.